Signal Waste offers a broad range of waste and recycling options for homes, businesses and commerical properties. We care for the environment and strive to minimise waste and landfill through our rubbish removal and recycling services. The main advantage of recycling is that it reduces landfill and this reduces the harmful impact it has on the environment. The more waste that can be recycled and used for another purpose means the less amount of waste ends up in landfill. Signal Waste & Recycling are committed to reducing waste and work closely with the South Australian Government and Waste Reducing Programs such as Zero Waste. Zero Waste is a government initiative set up with the aim to reduce landfill by 35% by 2020. Signal Waste and Recycling offers a number of recycling options for your home or workplace. We can provide a paper and cardboard recycling bin on your premises ranging in sizes to accommodate your recycling needs. From office desk boxes for paper recycling to large 30 cubic metre recycling skips, Signal Waste and Recycling can take care of your waste and recycling for you. Recycled paper creates 74% less air pollution and 35% less water pollution so order your recycling bin today to start making a difference! For Adelaides best prices on cardboard and paper recycling call now on 8162 5544 . 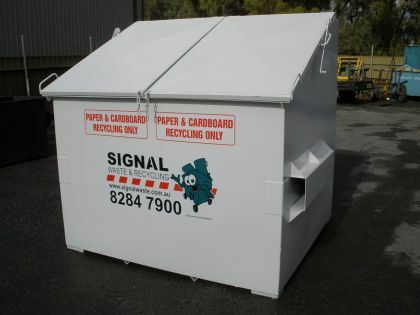 Signal Waste provides a complete range of bin hire for the collection of cardboard and paper recycling in Adelaide, South Australia. Our cardboard and paper recycling bins are designed to be placed at your worksite and collected and emptied on a schedule that suits you. Recycling in Adelaide is on the up and up. According to Zero Waste SA during 2010 South Australians have recorded a combined recycling total of 2.76 million tonnes. That's over 1.6 tonnes per person. Through the use of a commercial recycling bin service from Signal Waste and Recycling, you too can play your vital part in the continual increase of recycling in South Australia. 1.5 cubic metre front lift cardboard recycling bin. 3 cubic metre front lift cardboard recycling bin. 4.5 cubic metre front lift cardboard recycling bin. Office desk boxes for paper recycling. 240 litre wheelie bins for paper recycling. 240 litre wheelie bins for confidential documents. 660 litre wheelie bin (rear lift bin) for cardboard and paper recycling. 7.5, 15 and 30 cubic metre roll on roll off walk in bins for cardboard and paper recycling. 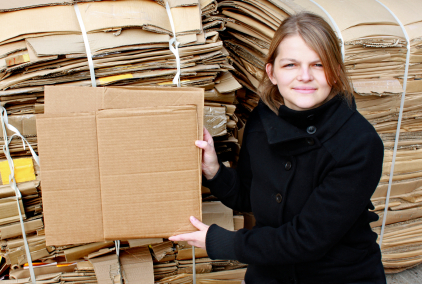 Some interesting facts on cardboard and paper recycling. Since European settlement, almost half of Australia's forests have been cleared. An area the size of the ACT is logged every year in Australia. Over half of this wood is chipped for paper pulp. It takes up to 24 trees to create one tonne of virgin office paper (that is paper with no recycled content). Producing paper from recycled paper pulp uses 60-70% less energy and 55% less water than manufacturing from virgin pulp. It requires approximately 3 cubic metres of landfill space to dispose of 1 tonne of paper. Recycled paper creates 74% less air pollution and 35% less water pollution. Every tonne of recycled office paper saves 2.5 barrels of oil.